I did it! I went to sleep at 6pm last night and got up at 2.30 this morning, just like I planned! This may seem easy to some of you – and questionable to those of you who stayed up all night, but I have a lot of trouble with the whole sleep thing to begin with. I fired up the laptop and the coffeemaker (in that order), hopped in the shower really quick because I need to bolt out of here when all of this is done, got my coffee and settled in for Ichiro’s first hit; an infield single. Oh, it’s good to be back. Whatever it was, it was hit to center field and it was hit hard. Ichiro managed his second single after that, and stole second successfully as Justin Smoak grounded out to second baseman Jemile Weeks. Jesus Montero lined out to right fielder Josh Reddick (the learning curve on some other teams’ players is going to be high for me this year, I think) who made a marvelous running catch, mouth guard and all, to get the out. We got our one-run lead (how terribly typical), but nothing further. Mike Carp flew out to left field, and that was that. Oakland didn’t let us lead for long, though. The bottom of the 4th saw a double by Cliff Pennington, then a sacrifice ground out by Coco Crisp to move Pennington to third, and a double from Kurt Suzuki to bat Pennington in. I got the distinct feeling that extras might happen. Felix looked completely relaxed and like he was hardly breaking a sweat through five, and it was at this point in the game I figured he was probably going to shoot for a CG. That would be just like Felix. The “I-chi-ro” chant started lightly in the top of the 6th during Ichi’s third at-bat. Ichiro also got his third hit for the game, moving a freshly-on-base Figgins to second with a grounder up the middle. Jesus Montero grounded out for the final, leaving our guys stranded and the Mariners’ side of the inning scoreless. The A’s got runners on first and third in the bottom of that inning, but Felix managed to get Josh Reddick to line out to Mike Carp in left field to strand their men, too, and end the inning. I kept losing GameDay and having to refresh, so I missed most of what happened in the 7th due to having to get ready for work. 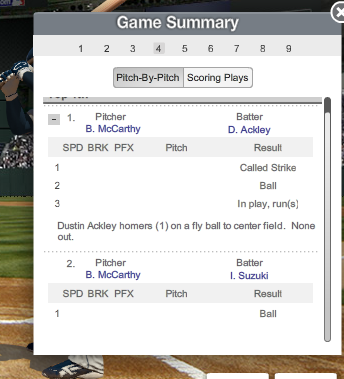 But by the 8th inning, Brandon McCarthy was done for the day, and spelled by Ryan Cook. The bullpens in the Tokyo Dome are apparently behind the dugouts, so there was no way for the broadcast to pick up on guys warming up. I like this idea because there is no risk of balls hitting anyone in the bullpens, and the relief is likely a surprise to the opposing team all the time (though I’m not 100% sure what happens during a regular Japanese season), but hate it because we have no way of seeing who is warming up at home, and neither do the broadcasters. It’s not a huge deal during these two games, but I don’t think I’d like it if it was that way all the time. At the top of the 9th, Ichiro walked up to the plate and the flashbulbs started going like crazy, as they have been the whole trip for the Mariners. Grant Balfour came in to throw for the A’s against him, and the crowd got to their feet while LMFAO’s “Party Rock Anthem” struck up. It seemed like a good time for Ichiro to go 4-4, but he would remain 3-4. I sure can’t complain about that. Justin Smoak was up to face Balfour next, and was patient about it. Smoak took a full count before hitting one off the first base bag. The ball bounced over the A’s first baseman’s head, and to a running Jemile Weeks, who successfully managed to get it to Balfour, who was running in to cover. Jesus Montero flew out to center field to close out our 9th, giving the A’s the advantage. Felix was not allowed to pitch further, and was taken out in favor of Tom Wilhelmsen. Wilhelmsen got Kurt Suzuki to fly out to CF, and Josh Reddick to fly out to Mike Carp, who made a rather dramatic jump to get the out against the left field wall. Oakland newbie Yoenis Cespedes, already 1-2, struck out swinging on a low pitch from Wilhelsen, 1-2-3. On to extra innings! Brian Fuentes was up on the hill in the top of the 10th against Mike Carp. Carp popped up to Kurt Suzuki, who swiftly but carefully ran over towards the first base dugout to make the catch…and that was about as exciting as things got for us. Brandon Allen reached base on a throwing error by Dustin Ackley, who swore enough – in slow-motion replay – to make any longshoreman proud. Allen’s pinch runner Colling Cowgill got caught stealing second, removing the A’s baserunners. Jemile Weeks was the A’s last batter, and he was called out about as dramatically as I’ve ever seen by the home plate umpire. On to the 11th. Brendan Ryan hit a nice double into center field off the arm of A’s reliever Andrew Carignan. Chone Figgins moved Ryan to third, and Dustin Ackley batted in his and the team’s second run of the night/morning with a single to center field. After a mound conference and a switch to left-hander Jerry Blevins, it was once again Ichiro time. Ackley used the moment to steal second. Ichiro then sacrificed himself to get Ackley in for a 3-1 lead, and got caught in a rundown, to the thrill of the packed stadium. Ichiro starts out the season with 4 hits in a game, tying Ken Griffey Jr’s record. And with our two-run lead, Brandon League was brought in for the close. League, steely-eyed and doing what looked like breathing exercises, worked slowly but steadily. Cliff Pennington flew out to left, Coco Crisp was called out on strikes, and Seth Smith hit a comebacker up through center field that almost hit League in the head; the ball went right between League’s face and his glove, which he was holding up defensively in an attempt to catch the ball. Kurt Suzuki was up again next and was caught out swinging. Mariners win the Opening Day game, Ichiro goes 4 for 4, and Dustin Ackley starts the season out right. Dave Simms and Mike Blowers did a marvelous job calling the game from a few thousand miles away, sitting here at home and working off the long-distance feed. There were a bunch of Twitter folks up and at ’em from the beginning of the game. Sadly, Felix did not get the win, but the Mariners did, and that makes it totally worth getting up at the hour I did. Tonight, we do it all over again. Happy Opening Day, everyone! 2 Responses to Baseball Is Finally Here! All I can say is, YAYYYYYYYYYYY!! !